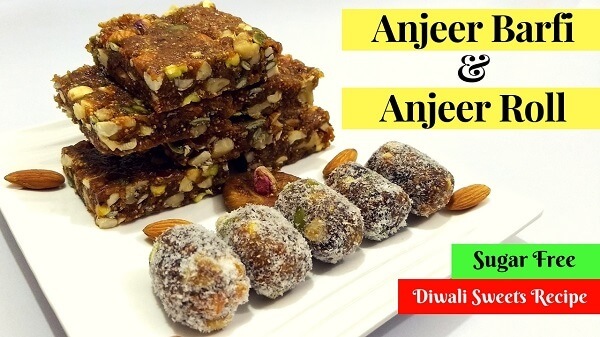 Today I am sharing a Sugar Free and Healthy Diwali Mithai Recipe – Anjeer Barfi and Anjeer Roll. 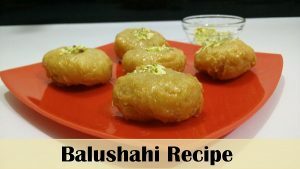 Made from Anjeer (Dried Figs) and dry fruits, and the best part, no cooking is required to make this sweet dish. Some recipes include Mawa or Milk Powder to prepare Anjeer Barfi or Anjeer Rolls, but I have not used any Milk product in this method. Learn How to make this delicious & mouth-watering Dry Fig Burfi & Dry Fig Roll at home with this step-by-step Recipe video. Chop Dry Fruits (Pistachio, Almonds, Cashew Nuts & Walnuts) into small pieces and keep aside. Chop Anjeer into small pieces using Kitchen Scissor or knife. Add chopped Anjeer in mixer jar with seedless Dates and Raisins and grind. Add the mixture into a large bowl. Add all dry fruits and mix well all the ingredients. You can make Anjeer Barfi and Anjeer Roll using this mixture. Take a greased plate or cake tin and line with butter paper. Pour the mixture into the tin, spread evenly and press using spatula or spoon. Keep in refrigerator for about 2 hours until set. Take a small portion of the mixture in your palm and roll into a ball. Place the ball on a chopping board or flat surface and roll it into a cylindrical shape. Prepare all rolls in the same way. Coat each roll with desiccated coconut and keep in the refrigerator for about 2 hours. Dried Fig Barfi & Dried Fig Rolls are ready to serve. Store in refrigerator and consume within two weeks.